There's a lot of love and hate for characters in the Star Wars universe. Ewoks, Jar-Jar Binks, Watto, Salacious Crumb, Lumpy from the Holiday Special... personally, I love them all. Yub Nub! Anyways, the Porgs from The Last Jedi are the latest characters targeted by the usual dorks on the Internet. How anyone could not adore these cute and hilarious little space penguins with the perfect amount of screen time is beyond me. Even the mighty hungry Chewbacca was conflicted on chowing down on one, even though a roasted Porg does look quite delicious. 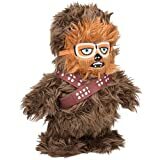 Anyways, if you're on team Porg, then check out this cool new Star Wars: The Last Jedi Porg Animated Plush. This adorable life-sized Porg replica stands 10 inches tall, moves its mouth and wings, and makes 3 different sounds. Best of all, they won't infest your entire home with nests, unless you give in to their cuteness and buy hundreds of them. Entertainment Earth Star Wars: The Last Jedi PORG 6 1 / 2"